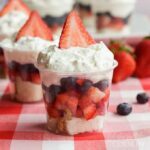 Mini Shortcake Cups: perfect for Memorial Day or July 4th! It’s likely that someone will correct me for using the term “shortcake” in this recipe name. Strawberry shortcake is traditionally made with a sweet cake or biscuit, so technically these cute little cups are not shortcakes. 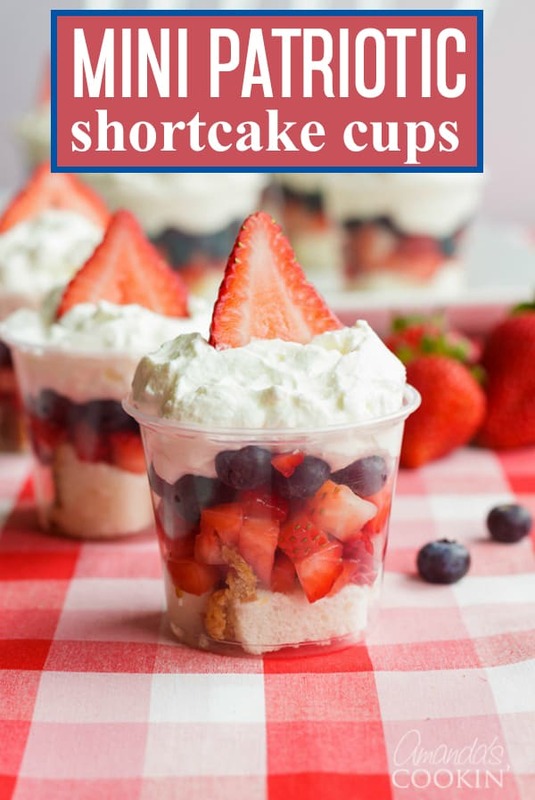 But I called them Mini Shortcake Cups because I know plenty of people who have adapted the old favorite by using angel food cake. So where do the blueberries come in you ask? Just like in our American Flag Brownies, the blueberries create a patriotic color scheme making them perfect for Memorial Day or the 4th of July! The summer months bring us bushels and baskets full of ripe strawberries, raspberries, and other seasonal fruits. Summer also means that we want to try and keep things a little lighter in the dessert department, so angel food cake is an ideal choice. Sure, you can make an angel food cake from scratch, or you can grab one from your local grocery store already made. 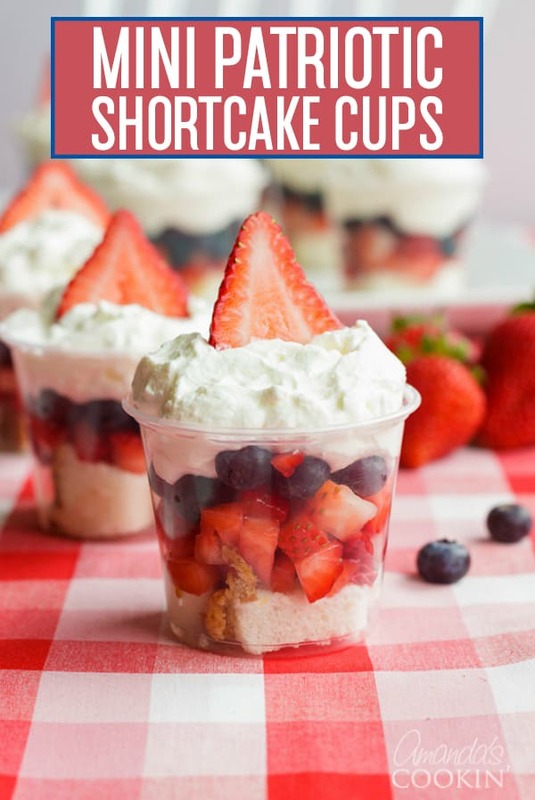 I think you’re really going to love these mini shortcake cups because they are so incredibly easy to throw together, they are small, but not too small, and they look totally fun and impressive. When food looks fun, it draws people in. Your guests will comment and smile and happily take one because it looks like you worked so hard on them! And bonus, less than 60 calories per cup! I used basic white plastic spoons with a few star-shaped foam stickers. Easy peasy. If you’re looking for cute, try the short wooden spoons. But be forewarned, you can’t find those at Walmart or the dollar store, you’ll have to plan ahead and order them or find a party supply store that carries them. When looking for containers for these individual shortcake cups I found some plastic snack cups with lids at Walmart in the aisle where plastic utensils, paper plates, and napkins are sold. I thought these were ideal in case anyone wanted to take any home, they could just pop on a lid! You can use Cool Whip if you like. I actually used whipping cream and I beat it in my mixer with some powdered sugar. I don’t have anything against Cool Whip or canned whipping cream. To each his own. So you go ahead and use whatever you like best. It won’t offend me! 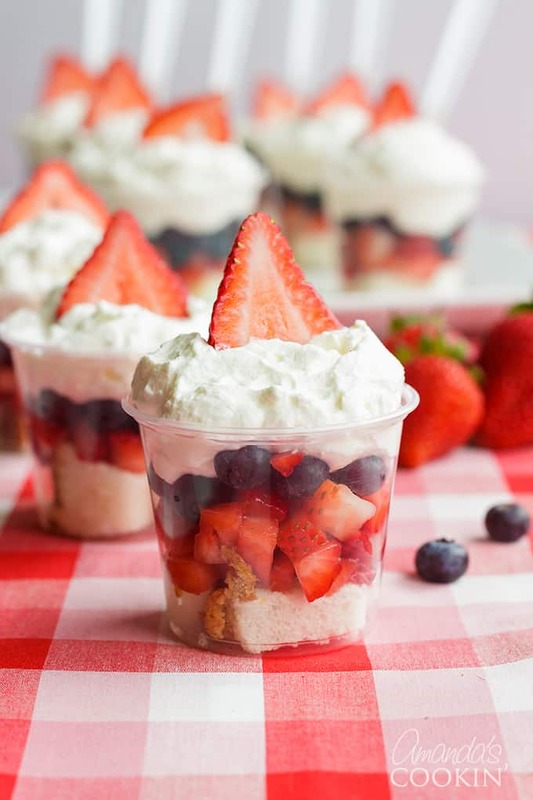 If you want to make these mini shortcake cups ahead of time you totally can just don’t add the whipped cream until you are almost ready to serve them. Whipped cream, especially fresh that you have whipped yourself that does not contain stabilizers, can begin to collapse as time passes by. It’s safe to add the whipped topping a few hours before serving, just keep them in the refrigerator until you’re ready to hand them out. 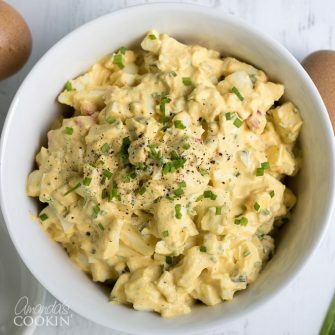 You can get a printable version of this recipe below. 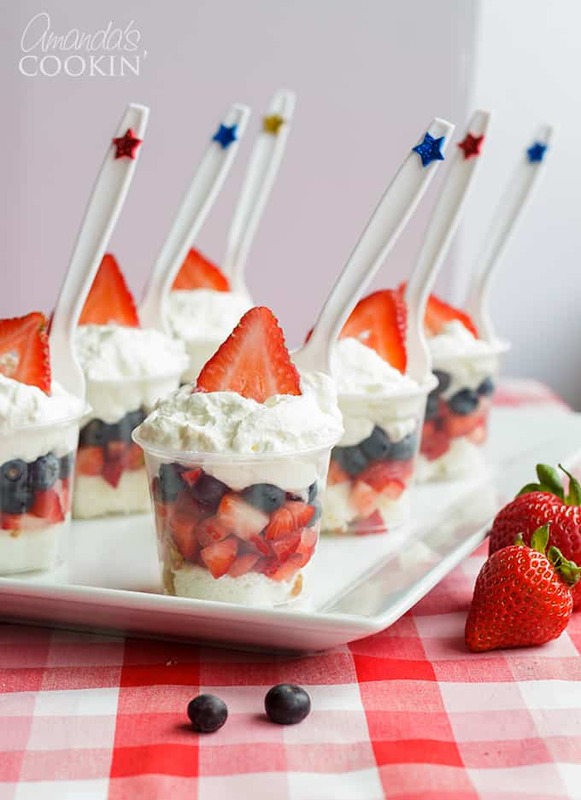 I have a patriotic American flag kabob recipe that uses angel food cake as well, so if you have leftovers from these little cups, don’t despair! You can definitely use them up there. You don’t have to stick with just blueberries and strawberries. Heck, some people might not like strawberries (gasp!). You can use raspberries for the red fruit and blackberries for the “blue” fruit. There’s a photo below showing a few different variations, do whatever you want! There are no rules. You could even bake up a box of white cake or use a pound cake if you want. You just do whatever makes you happy and that will make your guests happy too. We have Memorial Day at the end of May and Independence Day on the 4th day of July. Some people like to make patriotic desserts for Labor Day as well, even though it’s not really designated as a patriotic holiday. But if you’re looking for a couple more ideas, this Patriotic Candy Bark is fun to make and the kids really love it. It’s also great to package up as a gift! 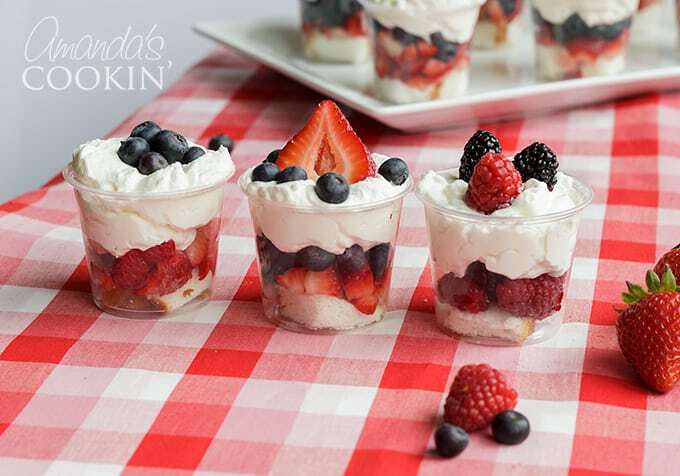 If you really like layered desserts, these no-bake Berry Cheesecake Trifles are assembled in mason jars, making them very portable. My American Flag Brownies are also a great way to welcome home a soldier or to bring to a 4th of July or Memorial Day potluck. I hope you have an enjoyable holiday. It’s such a great opportunity to spend time with your family and friends. So be sure to take advantage of it! 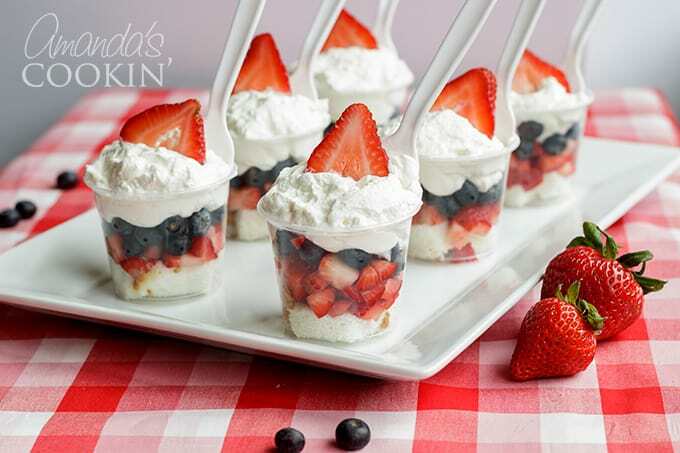 Mini Shortcake Cups are perfect for Memorial Day, 4th of July or just any time. These adorable little fruit and cake cups are just the right size. This post was originally published on this blog on May 19, 2017. I made the mini shortcake cups, they were very easy to make and turned out beautiful. Everyone at out 4th of July party loved them. I would definitely make and serve them again. Thank you for a great recipe!!!!!!! How fun!! Thanks for sharing Dottie! What a great party treat! I’d love it if you shared this on the What’s for Dinner Link up!